There are few things worse – it’s a fine evening, the sun is due to set in an hour or so, you’ve got nothing else to do, and you want to go and snap some photos – but where do you go? There’s a temptation to just look out the window, or visit old haunts, but you’ve probably taken every picture there at sunset and sunrise and a thousand different weathers in between. You have no idea where to go. You’ve got Photographers Location Blackspot. However, technology can come to the rescue! Over the next few posts, I’ll look at a few tools that can help you find your way – pardon the pun. You can see from the map that sunset is just south of that little island (Little Cumbrae) from where I would be standing. You can also see from the panel on the right at what time I should be standing there. 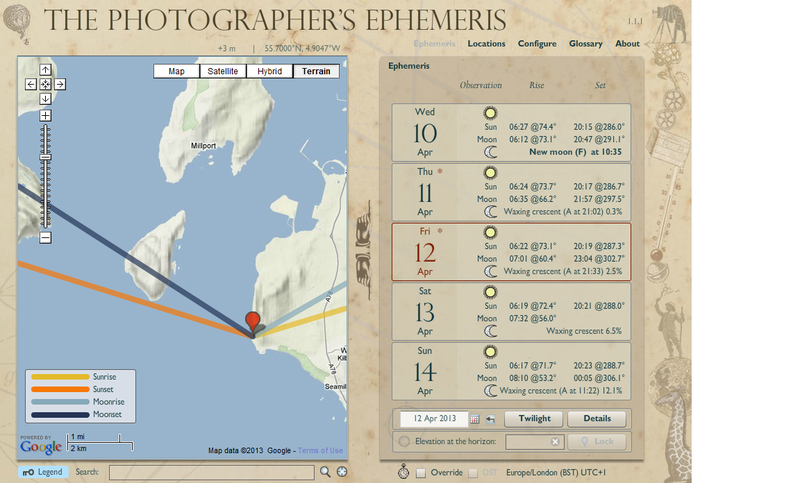 As you can imagine, this is quite a powerful tool – if you add your favourite locations, you can nip out and photograph them whenever you can fit it in to your schedule. It’s available as a desktop tool, and also as an app for iOS and Android, but it is a little pricey – £5.99 for the Apple one and £3.10 for Android. As far as I’m aware you can’t log in and share locations between devices – this would have been a killer feature since it’s likely that you might want to work at your desktop looking for interesting places, but you might want to save them when you’re out and about too. 3D Map support would be nice here too – to see which side of a hill or building will be lit could really allow you to visualise what you’re photographing before you even leave the house. Perhaps that could go onto their requirements list for the future. In conclusion – this is a useful tool that, provided it’s not cloudy, can really allow you to fit photography into your life rather than visiting locations and just having your fingers crossed for the right light. 24 Apr	This entry was published on April 24, 2013 at 12:45 pm and is filed under Tools. Bookmark the permalink. Follow any comments here with the RSS feed for this post.